The recent, very vicious hailstorm we suffered here in the north part of the city a couple of evenings ago, and the heat (long overdue!) that has followed has ended the bloom period of the wild roses (Alberta’s provincial flower, Rosa acicularis), which shine in the cooler, wetter days of June. Last weekend, before all the crazy weather hit, I decided it was time to finally try making wild rose petal jelly. It’s been high on the list of my canning priorities for quite awhile, but, for one reason or another during the past few summers, I’ve missed the window for gathering fresh, dark, fragrant petals. A short early morning hike in a nearby wooded area and a quick trip to the grocery store to pick up some liquid pectin, and I was ready to go! I used this super-simple recipe from the blog Wood Ridge Homestead in the Shenandoah Valley, and the results were supremely delicious! (I would recommend skimming the batch before putting it into the jars to make sure your jelly is as clear as possible). 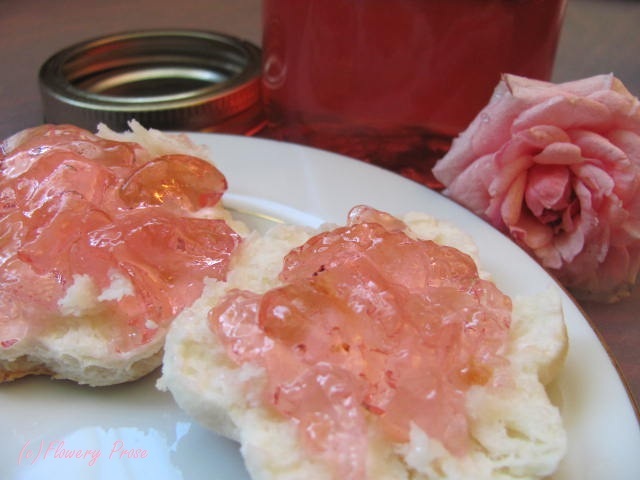 Have you ever made rose petal jelly? What about rose hip jam? That’s on my list for late summer canning! A whole lot of Rosie (Edible Things) – more yummies to make with rose petals! Rose petal granola (101 Cookbooks) – sounds delicious! They called me the Wild Rose (Edible Things) – rose petal jelly sans storebought pectin! 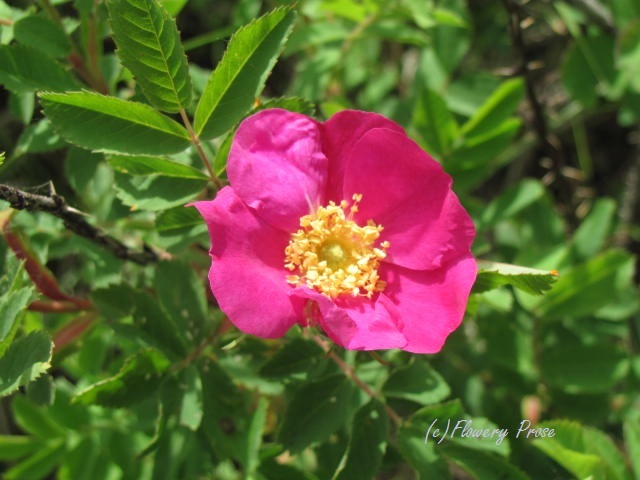 This entry was posted in Botany, Gardening, Horticulture and tagged Alberta, Edible flowers, Flower, Fruit preserves, Prickly rose, Rose hip, Wild rose. Bookmark the permalink. This looks so good! I’m dying to try it! Today I went to the farmers market, bought a bunch of strawberries and got the kitchen way too hot making jam. Strawberry jam, isn’t that one of the five basic food groups? Thanks for the post! That’s a great idea! This was my first time making jelly or jam with flower petals, and I was pleased with how easy it was to prepare the roses for canning. I hope it works for you with your peonies next spring! That’s a beautiful jelly. I dry rose petals from my garden and use them in herbal tea. So very pretty. I’ve never done it before, but am tempted. Just so beautiful, especially on a gorgeous biscuit. lovely, something new to try next year I guess.